Thyroid hormones are critical for regulating the body’s metabolism. If the thyroid is not functioning properly, it can have a negative impact on nearly every metabolic process within the body, including your energy level and mood. The thyroid gland is vital for stabilizing the body’s protein, carbohydrate, and fat metabolism, mitochondrial function, vitamin utilization, blood flow, digestive process, nerve and muscle activity, hormone secretion, oxygen utilization, and sexual and reproductive health – as well as many other body functions. 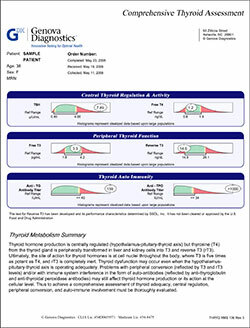 A Comprehensive thyroid assessment is a detailed analysis of the thyroid hormone metabolism, including thyroid gland production, activity, secretion, and regulation. The test is able to accurately pinpoint common imbalances that could be causing a variety of chronic illnesses. As primary regulators of the body’s metabolism, thyroid hormones are an important function in the body. Imbalances of such hormones can have significant effects on energy levels, mood, and overall health. The comprehensive thyroid assessment is highly-effective at revealing imbalances that would otherwise go undetected. The assessment not only identifies hyperthyroidism and hypothyroidism, but also sub-clinical manifestations of thyroid dysfunction, such as auto-immune reactions. The test also has several other uses. It can detect metabolic irregularities due to mineral and vitamin deficiencies, chronic stress, heavy metal toxicity, aging, and enzyme dysfunction. Ensuring that your thyroid continues to function well is invaluable in preventative medicine. A smooth-running thyroid can safeguard against the onset of obesity, diabetes, depression, and heart disease, and plays a critical role in healthy sexual and reproductive function in both men and women. The thyroid is a butterfly-shaped gland located in the neck. As one of the biggest hormone-producing glands in the human body, it is essential for healthy body function. It not only controls how quickly the body is able to use energy, but also how it makes proteins and controls how sensitive the body should respond to other types of hormones. Triiodothyronine (T3) and thyroxine (T4) are the two thyroid hormones produced by the thyroid gland. They both help regulate the metabolic rate in the body and can have a direct effect on growth and the function of other body systems. Zinc, iodine, tyrosine, and selenium are all nutrients used to make these hormones. Reverse T3, an inactive form of the T3 hormone, can also lead to symptoms of hypothyroidism. High levels of RT3 can explain why some people experience hypothyroid symptoms even though their T4 and T3 levels come back to normal. If you’re suffering from symptoms associated with thyroid function, don’t hesitate to call Vitalia Healthcare in Vancouver for proper diagnostic and treatment. Our Naturopathic approach uses highly-effective testing methods, such as our Comprehensive Thyroid Assessment, to accurately measure thyroid function. For more information about any of our testing or treatment procedures or to schedule an appointment, call us today at 1-604-566-WELL (9355).